Part three of our four part series continues today. Are you enjoying this travel back in time in Schroon's history? Got a memory or an event to share? Tell us in comments. World War II was starting in Europe and with it the horror of the Holocaust. Many refugees from Europe were Schroon summer guests. The Leland House continued as a smaller hotel at another site. The Brown Swan and Scaroon Manor continued, but it was the beginning of the end of the era of big hotels in Schroon Lake. Later jet travel and an expanded highway system changed the vacation habits of Americans and decreased Adirondack tourism. Purchase of Brown Swan Club, Clarke Island and former AlBurNorm Motel by Word of Life brought the international organization to the Adirondacks. The Town of Schroon purchased the former Leland House park land, the Boathouse, the old Windsor Hotel property (now the site of the Town Hall and Health Center) and the previously private Golf Course, adding to the town’s attractions. Art Benson and his partners built a western theme park for the Adirondacks. 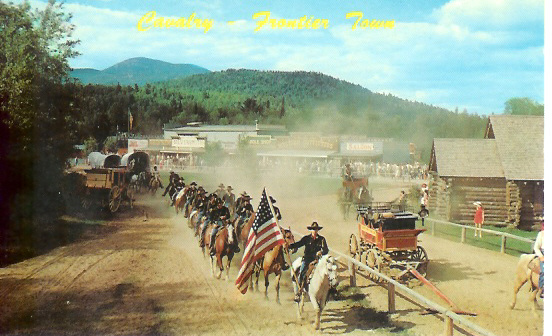 The site, on the winding Schroon River, was ideal for the rodeo, train rides, shops, food stores and other features. It delighted many thousand children and parents, brought job opportunities to North Hudson and had significant economic influence on the region. The last section was completed, opening the highway in time for Montreal Expo 67. The Northway could have gone through the Champlain Valley or by the foot of Pharoah Mountain. Champlain would have destroyed farms and orchards; Pharoah would have used 400 acres of Forest Preserve. Schroon and other interests lobbied for and won a third route. Millions of travelers use the highway for business and vacations.